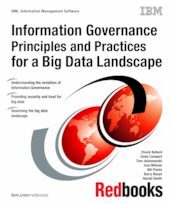 This IBM® Redbooks® publication describes how the IBM Big Data Platform provides the integrated capabilities that are required for the adoption of Information Governance in the big data landscape. As organizations embark on new use cases, such as Big Data Exploration, an enhanced 360 view of customers, or Data Warehouse modernization, and absorb ever growing volumes and variety of data with accelerating velocity, the principles and practices of Information Governance become ever more critical to ensure trust in data and help organizations overcome the inherent risks and achieve the wanted value. The introduction of big data changes the information landscape. Data arrives faster than humans can react to it, and issues can quickly escalate into significant events. The variety of data now poses new privacy and security risks. The high volume of information in all places makes it harder to find where these issues, risks, and even useful information to drive new value and revenue are. Information Governance provides an organization with a framework that can align their wanted outcomes with their strategic management principles, the people who can implement those principles, and the architecture and platform that are needed to support the big data use cases. The IBM Big Data Platform, coupled with a framework for Information Governance, provides an approach to build, manage, and gain significant value from the big data landscape.